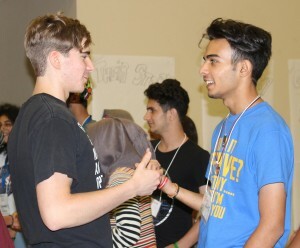 At NewGen Peacebuilders, our mission is: “to make learning to be a peacebuilder a rite of passage (for everyone).” Typically, this involves facilitating intense, locally-specific training and peace project mentoring for high school and university students in multiple states and countries. 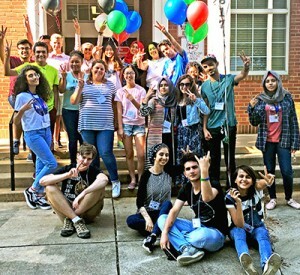 But we didn’t hesitate when invited to host a customized session that brought together Iraqi and US high school students at International House in Charlotte, North Carolina. The Iraqi students were visiting through the Iraqi Young Leaders Exchange Program (IYLEP) sponsored by the US Embassy in Baghdad and US State Department, and administered by World Learning. 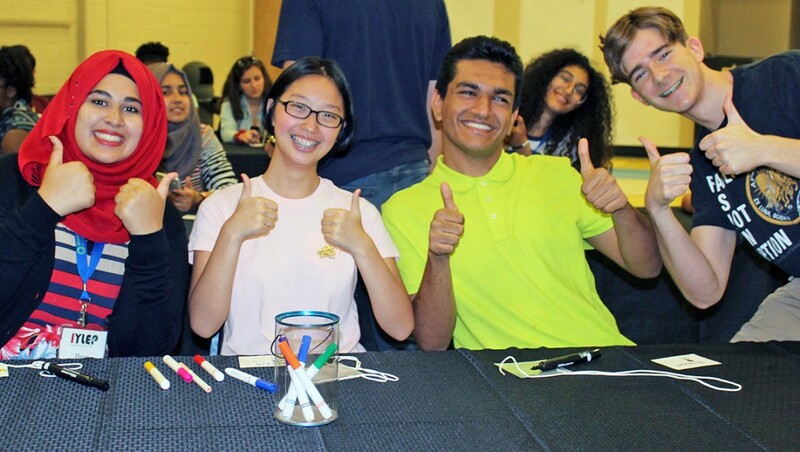 The US students are outstanding NewGen Peacebuilders alumni certified during a Spring 2017 cohort in Charlotte made possible with funds from District 7680 of Rotary International. Imagine 25 Iraqi and US high school students sharing ideas about citizen diplomacy and peacebuilding. Before walking in, they knew nothing about one another. To break the ice, students shared favorite songs; practiced greeting each other in English, Arabic and Kurdish; and listed people they admire as peace role models. Rev. Martin Luther King, Jr., resonates across borders and cultures. 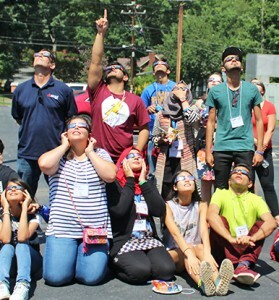 This NewGen Peacebuilders session occurred on August 21, a day highly anticipated for the “Great American Eclipse.” We leveraged the eclipse as a shoulder-to-shoulder, elbow-to-elbow opportunity to build bonds. Students learned that a famous eclipse occurred in 763 BCE during the Assyrian Empire, what is now modern-day Iraq. Some records indicate that insurrection in the city of Ashur was interpreted as a consequence of the 5-minute total eclipse. Notes from Greek historian Herodotus record that a solar eclipse in 585 BCE prompted an end to war between the Lydians and Medes who saw dark skies as a sign to make peace. A multi-step exercise involved shifting from perceptions of one another (“they”) to a unified story of how to shape peace projects at home in both countries (“we”). First, Iraqi and US students separately listed notions of “the other” that are reinforced by the media. Then, in pairs, each Iraqi and US student expressed who he/she REALLY is and practiced Active Listening. Last, Iraqi and US students worked in groups to imagine solutions to three common problems: 1) educational barriers; 2) racial and ethnic conflicts; and 3) political violence. Good talk should lead to action. The IYLEP program requires Iraqi students to pursue change projects when they return home. Many of the US students called the session “one of the most exciting things we’ve ever done.” Several said they are inspired to build on peace projects they technically completed earlier in 2017. One project involves being cross-cultural mentors to refugees and immigrants. Another project focuses on training voters how to be open to differing political viewpoints. Want to know more about NewGen Peacebuilders? Click here to watch a short video. This entry was posted in General, NewGen Peacebuilders and tagged cross-cultural, eclipse, Iraq, Iraqi students, IYLEP, NewGen Peacebuilders, peace on August 25, 2017 by Patricia Shafer. Do Umbrellas Make Good Teachers? For example, there’s the Nyarweng Primary School inspired by former Lost Boys of Sudan James Lubo Mijak and Ngor Kur Mayol and their friends Phillips Bragg and Karen Puckett. And we’re improving the facilities of the Gumriak Primary School established by former Lost Boy James Manyror. But sustainable education also depends on teachers being paid, appreciated, and provided with resources – from classroom materials to coats, boots and umbrellas during the rainy season. Hunger is one big barrier to learning. In 2017, two agencies of the United Nations declared famine in certain parts of the country. 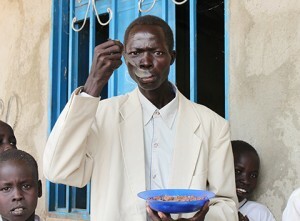 At Raising South Sudan project schools, meals are provided to all students. Lunch and tea breaks are a daily treat and motivator for teachers. And through a collaboration with nonprofit Rise Against Hunger, we’ve been expanding gardens and farms to improve nutrition and create cash crops that help sustain schools. South Sudan has an approved national curriculum, but most schools don’t have materials. With donations from US schools participating in our Walk for Wisdom service learning fundraisers, we bought teacher guides and student workbooks for all subjects across all grades. Grants from St. Luke’s Episcopal Church Foundation and the Peeler/Casey Foundation funded an illustrated series of folktales and continuous training on lesson plan development for 30+ teachers and staff. Most women in South Sudan haven’t finished primary school, so teaching staffs are generally male. So, we’re emphasizing education for girls. Thanks to proactive recruiting, girls make up 30+% of students at Raising South Sudan project schools and 50+% in Early Childhood Development classes. 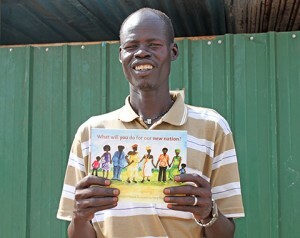 We were honored when South Sudan nominated this work for a UNESCO prize for girls’ and women’s literacy. Eighth graders (last year of primary school in South Sudan) recently completed mock national exams. The Gumriak school ranked #1 in Ruweng State, and Nyarweng ranked #3. But aspirations are even higher. Teachers must develop “schemes of work” and lesson plans, but professional development is rare. So, in September, our education facilitators are reviewing exam results and helping teachers set personal improvement goals for 2017 final exams and next year. Will you help us continue this progress? Support the Teachers, Embrace Our Kids. This entry was posted in General, Raising South Sudan and tagged educating girls, education, Gumriak, literacy, Lost Boys of Sudan, Nyarweng, primary school, South Sudan, teachers on August 18, 2017 by Patricia Shafer.